At UF, each digital collection is under the purview of one or more Curators or Program Directors, with collaborative support from the Head of Digital Development & Web Services and/or Digital Humanities Librarian. For scholarly digital projects and archives, teaching faculty partner and collaborate with Curators/Program Directors following the processes for their collections. 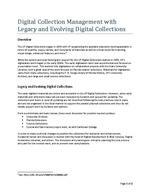 This documentation provides notes on Digital Collection Management with Legacy and Evolving Digital Collections, with notes on needs and options for older digital collections that need updates and for discussion of updates of the UFDC homepage, with it also evolving.